Call on us for safe and effective hornet removal at your home or business. The two most prevalent hornets found in Florida are the bald-faced hornet and the European hornet, although technically the European hornet is the only true hornet found in the United States. The bald-faced hornet is oddly both beneficial and a problem, as it kills yellowjackets and other pests but is quite aggressive in defending itself and its nest, and it can sting repeatedly. Since the nest of a bald-faced hornet can contain between 100 and 400 insects, it is best to have a professional handle the removal. A European hornet nest is similar in size, although generally at least 200 hornets are present. They are further a problem because they are active around the clock, unlike other species that go out only during the day. They are not as aggressive as some stinging insects, but they will defend their colony. 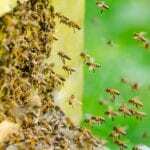 Here at Florida Bee Removal, we have more than 55 years of experience dealing with the various stinging insects in the Palm Beach, Florida area. You can count on our hornet removal services to be effective and performed in a safe manner. We use products that are safe around you, your family, and your pets. While the European hornet is also a beneficial insect because they are insect eaters, it is best to have hornet removal performed to avoid potential harm when they have settled near areas where children are playing or there is other foot traffic activity. In addition, a hornet’s nest attracts other undesirable pests, such as mice, that want to feed on the newly hatched hornets. There are plenty of hornets in the wild to provide insect control for our environment, so you do not need to be concerned that hornet removal will unduly affect their population. If you have any questions about hornet removal for your home or business, don’t hesitate to contact us.